How you lace up your skates can have a huge effect not only on your comfort but also your performance. Many people will be familiar with the uncomfortable experience of pain or numb feet caused by lacing your skates too tight, or in contrast too much movement in your skates causing blisters and heel slip. It’s a fine balance – so here are some techniques to help! 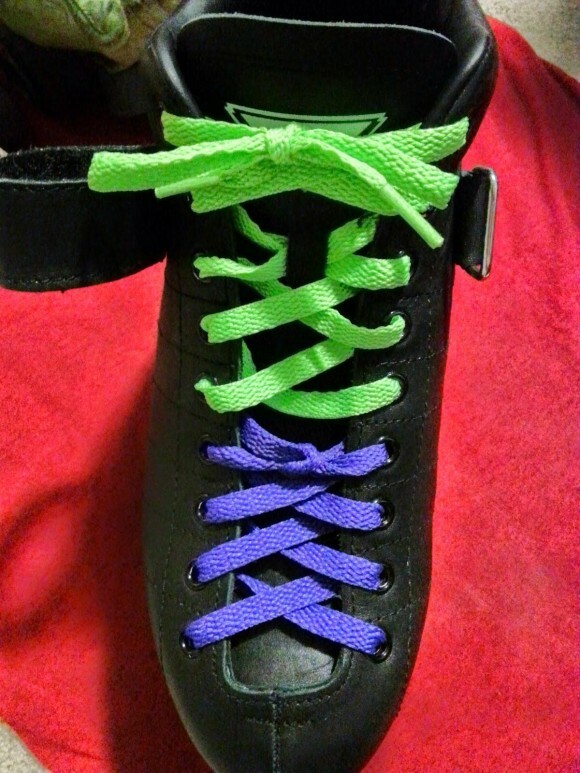 Solution: Using 2 pairs of laces (not skate laces) allows for different tensions, such as needing to lace the bottom half as tight as possible while leaving the top half loose, or vice versa. Each lace is tied-off with a bow or appropriate knot and is not connected to the boot’s other lace. This technique can help to keep the laces loose in that specific spot while still being able to tighten the boot adequately. Solution: Avoiding lacing over certain parts of your feet entirely can ease or eliminate this. 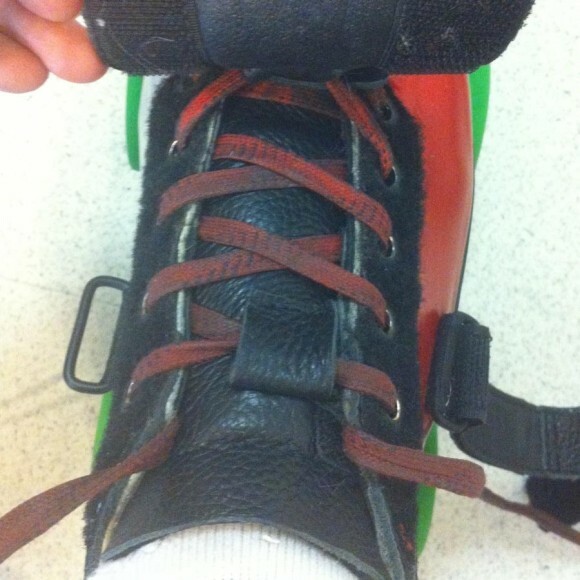 To do it, you will end up with your skates laced normally (horizontally) above and below the area causing you discomfort – but lace vertically in order to avoid putting pressure on the sensitive area by threading the lace through the next one to two rivets on the same side (see below). 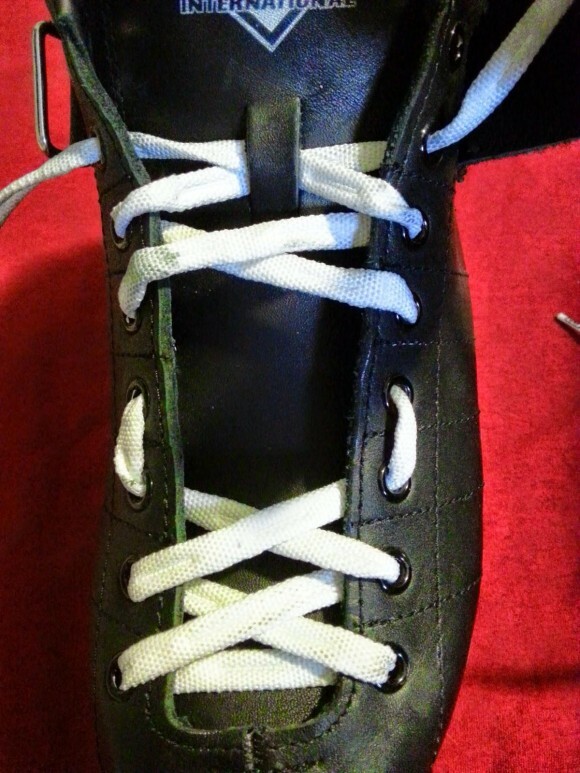 After you are done lacing vertically, resume normal lacing through the rest of the rivets and the tongue slot. Solution: Use extra long skate laces to lock your heel in place by wrapping your laces underneath your boot and plate once or twice before secure on the top of your foot in a bow. This should prevent your heel coming off the footbed when you skate. Solution: First, check to see if the tongue of your boots has a little slit or loops like the boot below. If so, make sure both laces are running through the loop, which will help to keep the tongue in place. 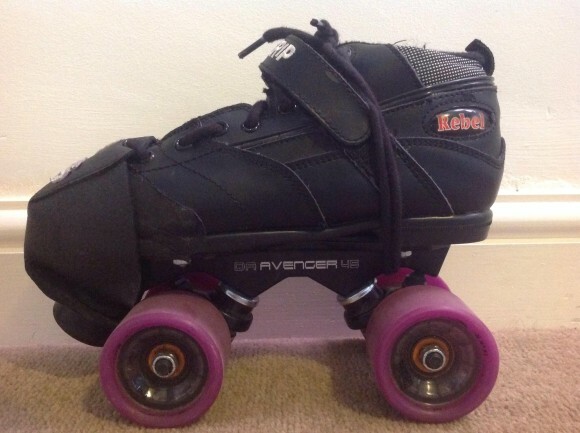 However, not all skates have tongue slits/loops so another technique to try is to switch to waxed laces. Waxed laces barely move once tied so prevent your skates from becoming looser whilst skating. You may need to experiment with the different variations to get your lacing technique just right but once you do you will be able to forget about uncomfortable feet and focus on giving 100% to your performance, so what are you waiting for?